This is the penultimate preview of the Vampire Bestiary before release (almost assuredly sometime in March). In the previous preview we took a look at some of the classic vampires in the book (I should point out that elements of those entries in the book have since changed (going to show how my deranged mind works). This time I thought it might be fun to showcase some non-vampires in the book. So lets take a look at a few cannibals. Okay, why cannibals, its a book about vampires, can’t you do anything right Krusty!? One of the ideas that seperates this bestiary from typical monster books is that its sort of homogenised in that it seemingly mixes disparate elements but blends or links them together to form a cohesive entity. If thats too cryptic an answer then the short answer is that each entry is linked to another entry with ultimately all links leading back to the core element of the book, vampires. Secondly, although I am playing down the four adventure portions of this book (which are pretty brief; about 2 pages each) they do link together to form an adventure path of sorts. Thus again, tying all the elements of the book together. So you could start questing for a fabled artifact, braving cannibal infested jungles at the Mountain of the Cannibal God…only to have the artifact snatched away by assassins. Giving chase through a gauntlet of traps and monsters the heroes arrive at a town under the thrall of a deadly sect. But can they survive the Night of the Thuggee and trace this murderous evil back to its source. Only to find that the artifact was simply a wedding gift for an unholy union between Castle Dracula with the ‘devil bride of Dracula’ none other than the goddess Kali (or rather her Aspect Bhowanee), the marriage of misfortune to be performed at the Temple of Death. As noted previously, all the pieces can be used seperately, but I had fun putting together a bit of a mini-adventure. 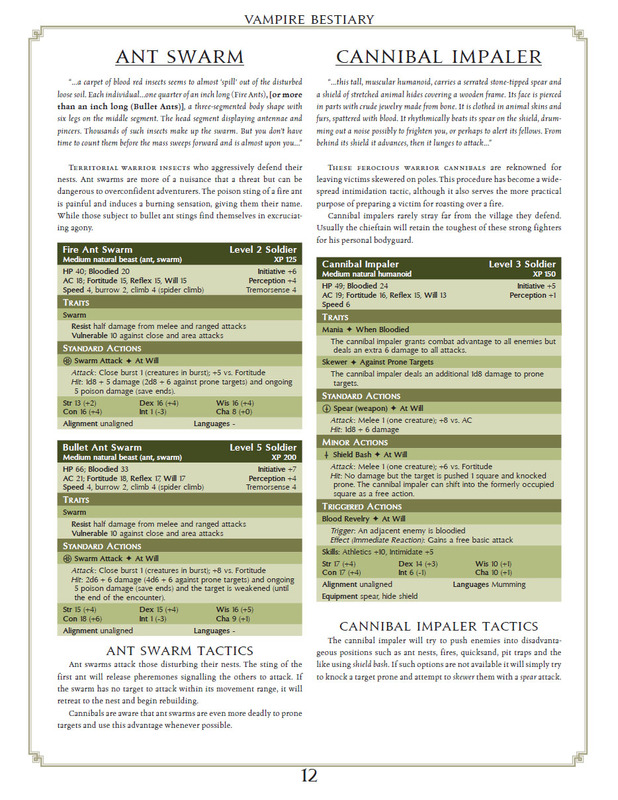 An expansion of my old ‘Adventure Ideas’ section in the Epic Bestiary. But anyway, back to cannibals. How do we get from vampire to cannibal. Well there are several links. I knew I wanted Kali in the book, partly because she is a blood-drinking goddess, but also because she created the Dakini, dancing vampire witches (who themselves will feature in a later volume). Kali naturally linked to the Thuggee Cult. But also (for those who have seen the classic Golden Voyage of Sinbad movie), Kali is worshipped by primitive cannibals. Many of the exotic vampires in the book (Jenglot, Chon-Chon, Impundulu among numerous others) are always mentioned in mythology in tandem with witchdoctors and shamen. Acting as pets, servants, spies, guardians and so forth. So I liked the idea of the idea using these two together. Most vampires are relatively powerful creatures, but I wanted the book to run the full spectrum of levels. There was no real dominant type of vampire below the classic vampire (although as you will see in later volumes plenty above the classic vampire in power like the Nosferatu, Varcolac and Strigoi to name but a few). Certainly not enough to build a decent sized entry around. So the cannibals and cultist entries perfectly filled the gap, since both have associations with various vampires. When I think of cannibals, I think of King Kong. So it would have been remiss of me not to have a type of Kong in the book, to give the cannibals another god to worship in case Kali wasn’t to your taste. So I went searching for a type of vampire Kong and found two. One of which being the Wendigo, the other I’ll have here in the final preview of the Vampire Bestiary in a week or so. So about this preview. Basically just wanted to show some fantastic Peter Szmer interior art, the newer layout, the fact that even the entry for the cannibal has its own bag of surprises in that its not just cannibals. I’d estimate these are 99% complete pages. 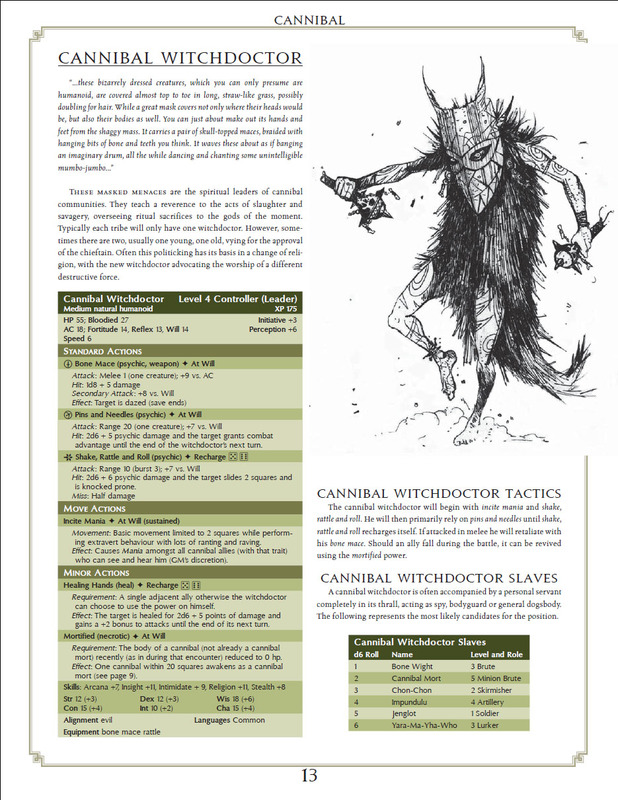 I may tweak a few more things like the tactics block for the Cannibal Impaler and I am still getting a little ‘noise’ on the Cannibal Witchdoctor illustration even after I had tidied it up (looks perfect in photoshop, but I’m getting some background noise when I place the jpeg file in the document and convert to pdf. As before, you can click on the page for a bigger version. Feel free to let me know what you think, where I’m going wrong or what I’m doing right and I’ll be sure to take any feedback on board. Hi Krusty – do you include vampire minion variants, like the ‘ghouls’ in Hellsing? I’m planning to start up a new 4e Wilderlands campaign ca July, and I’m looking at having vampires & Necromancers as a long term threat. Your Vampire Bestiary could come in handy, especially if it has good stuff for the mid-high Heroic tier; I’m unlikely to get into high Paragon or beyond. the book does indeed have loads of variant vampires for all levels between 1-15. That said, the ‘Classic Vampire’ section concentrates on levels 11-15…for instance the basic Vampire is a Level 11 Skirmisher. Some of the vampires have dual stats in that they would have Minion stat-blocks of Level 15 (for example) and then Standard Monster stat-blocks of the same creature 8 Levels lower (retaining the same XP total). The Cannibals cover levels 1-5 with links to five or six exotic vampires, plus the Wendigo (three versions) and one of the Wights. The Thuggee Cult and Kali entries spread over Levels 6-15. With suggestions that between Levels 6-10 would be a typical Thuggee Gang hideout, while Levels 11-15 would populate a Lesser Temple of Kali/Cult headquarters. Again there are links to many of the exotic vampires and some of the wights. The Classic Vampire section covers Levels 11-15 (although a few of the stat blocks are Heroic Tier). Its reasonably self-inclusive although has links to Vampire Familiars, Vampire Hunters and Vampire Intelligences. The Exotic Vampire section is basically the support section for the rest of the book. For instance the lower levels have a lot of vampires associated with primitive tribes; witchdoctors and the jungle. Whereas the higher levels have a lot of Indian/Hindu vampires and those with links to Kali. Thanks Krusty – hmm, for my purposes I think I really need proper vampires in the high-Heroic range, ca 6th-10th level. I’m planning to use 9th level as old-school ‘Name Level’, with PCs settling down and founding dominions. I was thinking of the vampire threat as something for the levels below that, ca 5th-8th. Well, the Vampire Spawn in the book would be Level 7 standard/Level 15 Minions. There are bestial vampire dwarves (The Tokoloshe) which are Level 5 standard/Level 13 Minions. For some reason these keep reminding me of the midget monsters from the Phantasm horror movies. There are also vampire babies (The Drekavac) which are Level 3 standard/Level 11 Minions. Some of the monsters revolving around the Vampire Intelligence (Pitris) entry are Level 10 (Minions, Standard and Solo). But as I said earlier your basic ‘common or garden’ ‘vanilla’ vampire is Level 11. This looks very promising. Well thought and creative monsters – I like what I’ve seen so far. That said, one of the advantages of this book, is that in designing the monsters from the start in groups allows me to incorporate a lot more synergy between them. Whether that will make a lot of difference to anyone using the book in the short or long term is debatable of course, but in theory it should make for a more rewarding experience. The other additional benefit of the thematic group approachs is that DMs will be able to create full fledged adventures using the monsters herein. Which is something I don’t think you can really do with the Monster Manuals because the focus is far more on a large number of disparate entries.